Get higher quality products, receive more on time deliveries and obtain highly attentive service from all of your suppliers without paying more for your purchases. Does this sound like the first line from a TV infomercial? Well it isn’t. 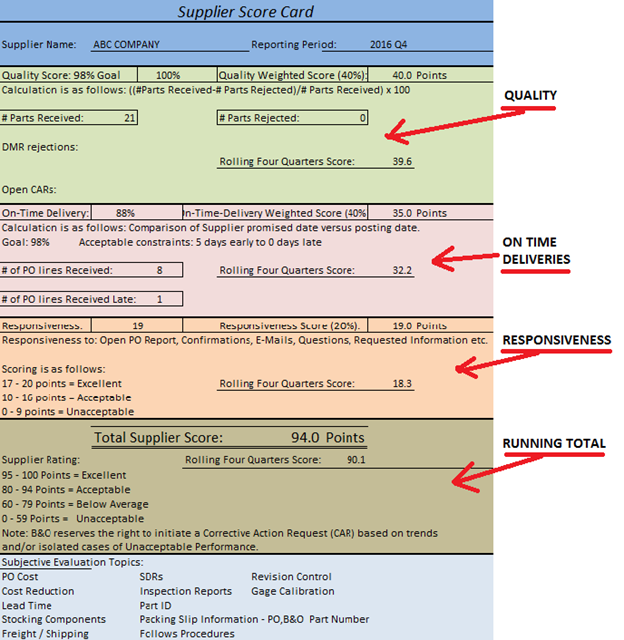 Developing a Vendor Scorecard Rating system will get you these results, fast. Companies that know that they are being held accountable tend to pay more attention to details. And a Vendor Scorecard system is a great tool that will encourage your Contract Machining Partners to put a higher priority on your company’s needs. To get started, identify what metrics are important to your bottom line, then track them. Metrics can include objective measurements like on-time deliveries and percentages of non-conforming parts. Evaluate and grade subjective matters such as responsiveness to expediting needs and quote requests. Once you have collected data for a few months review the numbers and look for trends. Determining the scores of your best suppliers will provide numbers as a benchmark for others to achieve. Once you have some attainable goals established, send out the scorecards. Let each recipient know that that first round of scores are merely a starting point. Invite shop owners, production managers, and quality department personnel to your facility for kickoff meetings. Keep the messaging upbeat and positive by expressing your desire to conduct business with the best suppliers that you can find and impress up on them that by steadily improving their scores they can expect a long term mutually beneficial and robust business relationship. If it matters to your company, measure it then communicate it.